The question leading up to former three-time world champion Robert Guerrero’s fight against journeyman contender Aron Martinez was whether Guerrero could rebound from his recent loss to top Welterweight contender Keith Thurman in March of this year. 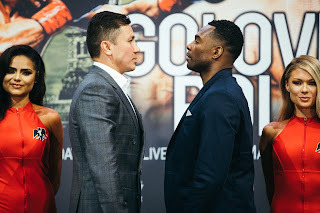 Although some viewed this fight as a mere “Comeback Fight” for Guerrero and did not give Martinez much of a chance, Martinez showed that he had come to fight when the two fighters met on June 6th at the StubHub Center in Carson, California. This fight was largely fought on the inside in the early rounds, but it was Martinez who was able to consistently push Guerrero back against the ropes and seemed to get the better of the majority of exchanges between the two. This was highlighted when Martinez dropped Guerrero with a combination to the body and head in the closing seconds of round four. Although Martinez seemed to have an advantage in the early rounds, an argument can be made that Guerrero had the advantage in the second half of the fight. As the fight progressed Guerrero was able to find success in keeping the fight in the middle the ring by controlling distance and landing the more effective punches. Guerrero was able to dictate how the fight was fought in this observer’s opinion in rounds six, eight, nine, and the tenth and final round based on his ability to control distance and get his punches off first. The fight however, was extremely close and I felt could have gone either way. At the end of the ten round Welterweight bout it was not surprising to see the official scoring end up in a split decision. Two official Judges Eddie Hernandez and Max DeLuca split scores of 95-94 for each fighter. The third and deciding Judge Jerry Cantu scored the fight by a significantly wider margin 97-92 in favor of Guerrero giving him a hard fought decision victory. Unofficially I scored this fight 95-94 in favor of Martinez due in large part to the success he was able to have in the first half of this fight. It was a bout however, that ended up being very difficult to score and it is understandable how there can be varying opinions where an argument can be made for either fighter. Following the fight I commented on social media that I thought the source of controversy if there was any in regard to this fight would center around Judge Jerry Cantu’s scorecard. Although I felt this fight was much closer than Cantu’s scorecard suggests and felt that Aron Martinez was able to get the better of the action in the early rounds, there was a lot of fighting on the inside during those rounds and some might feel that Guerrero was able to get an edge in some of those rounds depending on one’s perspective. The difference in this fight in my eyes was the knockdown that Martinez was able to score in the fourth round and that is what gave him the edge on my scorecard. Even though I scored rounds two, three, and four in Martinez’ favor, there may have been some who felt that Guerrero was able to win rounds one through three and taking into account what Guerrero was able to do in the second half of the fight, it is understandable how a scorecard like Judge Cantu’s can be rendered. Regardless of the scoring of this fight, I believe that Aron Martinez has established himself as a contender in the Welterweight division and gave a good account of himself in defeat. Even though Martinez came out on the losing end in this fight, he will likely get an opportunity against another top contender in the division and is deserving of a rematch against Guerrero should the opportunity present itself. As for Robert Guerrero, he was able to bounce back from defeat and put himself back in the win column. Although some may question the scoring of this fight and debate whether the decision was controversial, sometimes a win is a win and at the end of the day Guerrero did what he had to do, win the fight. It will be interesting to see whether Guerrero, who entered the fight against Martinez rated number ten in the World Boxing Association’s (WBA) Welterweight ratings will move up in those rankings off of this victory. For a fighter however, who has consistently taken part in exciting fights and has shown throughout his career a willingness to take on all comers, it is clear that Robert Guerrero is still a force to be reckoned with in the Welterweight division.